The speaker at our Christmas meeting will be John Farrant, who will be telling us about the changes at Lewes Castle between 1600 and 1850 – the period between its final appearance as a military asset during the Civil War and its becoming the centrepiece of the Sussex Archaeological Society collection. As usual the meeting will be held in the King’s Church Building, Brooks Road, and all are welcome. There will not be a Research Group meeting this month. Preserved through the centuries in the Cliffe parish chest, and now more safely housed in the East Sussex Record Office, is a copy of a 12 November 1409 charter granting Thomas Arundel, Archbishop of Canterbury, the right to hold a weekly market and two fairs each year in his town of Clyve [ESRO/Par.415/26/1/1]. The market was to be held every Wednesday and the fairs on the eve, day and morrow of St Mark (24-26 April) and of St Matthew (20-22 September). The charter was granted by King Henry IV and the witnesses signing it included the Archbishop of York, the Bishops of Winchester and Bath & Wells, Henry Prince of Wales (the future Henry V), the Duke of York and the Earls of Somerset, Arundel and Westmoreland. The final signatory, and presumably the man who actually wrote the charter, was Master John Prophete, keeper of the Privy Seal. Master John Prophete was a man of humble origins who had a remarkably successful clerical career. In addition to his roles as first clerk and then keeper of the Privy Seal, and thus a long serving member of the councils to both Henry IV and Henry V, he was simultaneously first Dean of Hereford and then Dean of York. Welsh by birth, he typically held a dozen clerical positions in different parts of the country at any one time, with a total income estimated at 1,300 marks per year. Early in his career (in the 1380s) one of these posts was chancellor and canon of the Collegiate Church of South Malling, a role whose principal source of income was the associated rectory of Ringmer. The actual management of the church in Ringmer was delegated to a vicar, with whom the income was shared. Master John Prophete is commemorated by a large medieval brass that survives in the chancel of the Victorian church of St Peter & St Paul, Ringwood, Hants. Can you identify the rather grand house in the photograph below? It comes from an old, probably Edwardian, postcard published by A.M. Bliss & Co, County Studio, Lewes. As Bliss postcards normally feature scenes taken in Lewes itself or the surrounding villages, it is likely to be local. According to the Lewes section of the normally authoritative website www.photohistory-sussex.co.uk, Alfred Marsh Bliss (1861-1928) was born in Wales, and moved from London to Sussex about 1890. In the 1891 census Bliss, his wife and baby son were living at 34 Lansdown Place, next to the Lansdown Arms. 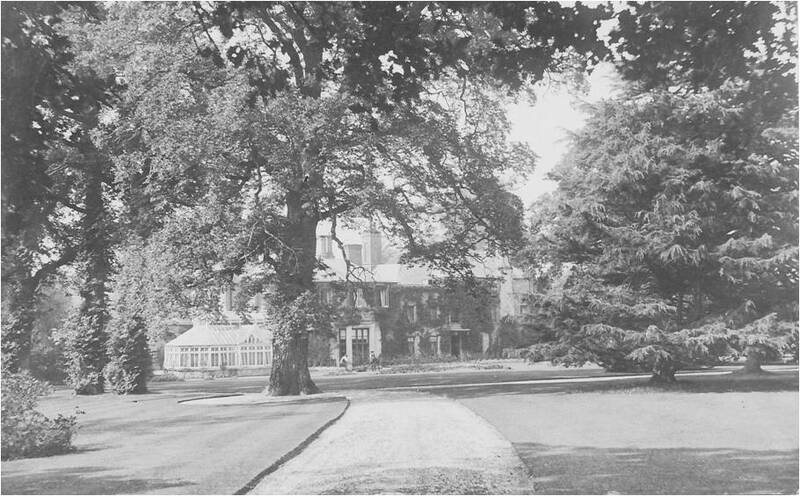 The Bliss family moved away before 1900, but the firm continued in other hands, but under the same name and at the same address, into the 1920s. The Sussex Archaeological Society Library at Barbican House holds some remarkable collections and resources for studying Sussex history. Members are welcome whenever Barbican House is open, and facilities are also open to non-members if accompanied. Colin & Judy Brent are happy for it to be known that they are generally there on Tuesdays, and would be happy to assist people use the resource there to get their research under way. One of our History Group’s aims is to make more readily available the information that is already known about the history of Lewes. We have started to assemble a bibliography of books and articles about Lewes, and an initial version has now been mounted on leweshistory.org.uk. A small group of volunteers is now trawling through the 150 volumes of the Sussex Archaeological Collections to identify articles that should be added to this source. https://leweshistory.org.uk/research-resources/lewes-history-group-bibliography/lewes-history-group-bibliography-contact-form/ or drop us a note. A rather dishevelled copy of the earliest known Lewes guidebook, Gideon Mantell’s ‘A Day’s Ramble in and about the Ancient Town of Lewes’ published in 1846 by Henry Bohn & G.F. Bacon was offered for sale on ebay in November. Both cover boards were detached and the binding in part failed, but the reserve starting price for the auction was a penny under £40. Mind you, the guidebook runs to 157 pages. One of John Eccles’ entertaining Lewes Rouser items in November included a brief history of Lewes prisons. The information about the earlier town jails can be traced back to Rev Thomas Walker Horsfield’s ‘History & Antiquities of Lewes’ published in 1824. It is thought that medieval malefactors will have been held in dungeons in Lewes castle, but by 1487 the town petitioned Parliament to establish a jail in the town, as at that date there was none in the entire county, so prisoners had to be held as far away as Guildford. It was probably at this time that the vaults under the old Star Inn (now Town Hall) were first used, as it was there that the Protestant martyrs were held prior to their immolation in the reign of Mary I. Prisoners at this time were commonly confined underground. Later there was a jail within the old West Gate (at the Bottleneck) but in 1610 a new House of Correction was built on the south side of Cliffe High Street. Horsfield knew exactly where this was, but it would take a Colin Brent or John Houghton to interpret his description. Then in 1789 land off North Street was purchased, and a new prison opened there in 1793. This was enlarged to 70 cells in 1817, and a treadmill that took 16 men to operate was installed in 1822. The footings of some of these cells were exposed this year in archaeological excavations prior to the construction of the new police station. After closure in 1853, this prison was used to hold Finnish prisoners of war captured in the Crimea (who were very popular locally) and then as a Royal Navy prison and a territorial army base. Construction of the present Lewes Prison on a site then outside the town began in 1849, and it opened in 1853. While the cells and facilities have recently undergone refurbishment, the physical environment in the older, listed, section of the prison remains Victorian. Please note that this year the February meeting will be on the third Monday of the month, because the second Monday falls on Valentine’s Day. This entry was posted in Ecclesiastical History, Legal History, Lewes, Social History and tagged bibliography, Bliss, Cliffe, Gideon Mantell, John Prophete, library, photography, prisons, Sussex Archaeological Society, Thomas Walker Horsfield. Bookmark the permalink.